We at Jordan Brooke Estate are happy to present to you our newly completed JORDAN TERRACES, our ultra-modern housing estate at Osapa London, Lekki, a ten minutes’ drive from your office. 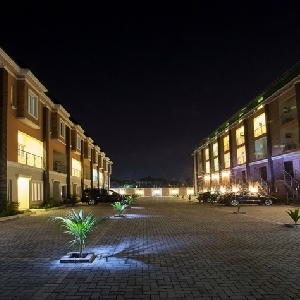 This newly completed development is in a new development layout at Osapa London, along the Lekki-Epe expressway. It is accessible from three (3) major roads including the one linking the Mobil filling station/Femi Okunnu road directly to this modern and organised layout. The property on offer is an 18 unit development consisting of 16 units of 4 and 5 bedroom terrace houses and 2 units of 3 bedroom flats (the flats are currently sold out). All rooms in all the units are en-suite and come with 1 room servant's quarters each. The development also has a large swimming pool (approximately 10m x 8m), Gym, separate spaces for each terrace unit and a 48-car capacity parking area. The development also comes with a fair-sized playground (approximately 18 m x 6 m). This offering also comes with kitchens fitted with Cookers, Ovens, Washing Machines and Microwave ovens. All rooms for the first 5 units purchased and fully paid for will also be fitted with Air-conditioners at no additional cost to the purchaser. The property has been funded entirely by equity contributions of the promoters, 100% debt-free and is in no way encumbered by debt. The title on the land is in the form of a Lagos State Governor's consent and we will be executing "Deeds of Assignment" to purchasers. Payment plans and discounts for outright payment available.